Are Large Cap Funds Beating Equity Market Returns? 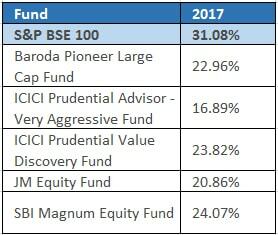 Some large-cap funds have beaten the returns of their benchmark whereas there are others who failed drastically. After reading this blog, one would be able to identify the Top Gainers, Top Losers, and Consistent Performers in the large-cap category. At the first time of investment in the equity market, investors often show risk-aversive behavior while their target is to attain maximum return. It can be easily achieved by putting money in the top performing large-cap stocks that can beat their respective benchmark, S&P BSE 100 return. Targeting such investors, Mutual Fund has a separate fund category, called Large-cap funds that invest a significant proportion of their corpus in companies with large market capitalization and strong growth potential. Although historical performance analysis is the best way to judge that how well the scheme can reward an investor, still, practically, have you ever compared Large-Cap Funds’ returns with S&P BSE 100 and do they actually beat their benchmark? 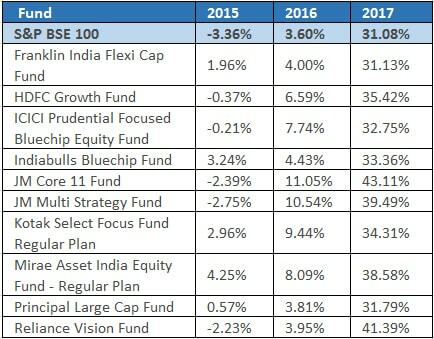 To evaluate this, let’s have a look at 51 large-cap funds that have been compared with S&P BSE 100 return considering their 3 years historical returns. Above table clearly reflects that in 2015, out of 51 stocks, 44 funds equivalent to 86.27% had shown exceptional performance and beaten the benchmark by about 3.36%. In 2016, benchmark gained 3.60% return while the percentage of outperforming large cap stocks significantly fell to 50.98%. A similar trend had been noticed in 2017, where S&P BSE 100 had delivered 31.08% return and was beaten by only 23 stocks. As the name implies, whenever we talk about the top performers, we meant the funds with the highest returns. 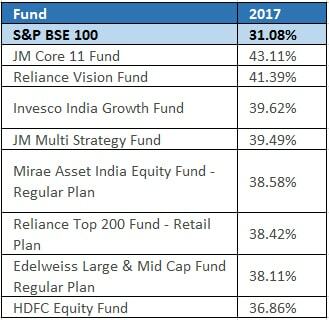 In 2017, JM Core 11 Fund achieved the top rank among all by securing 43.11% return, it has beaten both the category average (30.67%) and benchmark return (31.08%). Smart assets allocation strategy and concentrated portfolio and growth investment style are the key reasons behind such exceptional results. Another name in the list is Reliance Vision Fund which achieved 41.39% return beating its category & S&P BSE 100 return. The fund was ranked 1st by CRISIL for the quarter ended as on December 2017. Its fund manager allocates maximum in stocks with strong conviction & robust quality of management. Last year, out of 51, 28 funds failed to beat their benchmark, many of them did not even reached closer to the S&P BSE 100 return, therefore, they are termed as Top Losers. ICICI Prudential Value Discovery Fund has seen numerous strategic changes such as manager shrunk the portfolio size from 60 stocks to just 40 stocks and moved from mid-cap stock towards large cap tilt. Still the fund struggled recently and could not beat the benchmark with just 23.82% return. SBI Mangum Equity Fund which was earlier positioned as a strong performing fund with positive return of 2.43% despite the negative benchmark return of 3.36%. Eventually, in 2017, fund’s returns dropped below the benchmark, hence identified as under-performing fund mainly due to overweight in the cyclical sectors i.e., Automobile, Oil & Gas and Banking & Finance. In the field of investment, many investors desire to bet their money in consistently performing stocks which always beat their index. During 2015-2017, out of 51, only 10 large-cap funds had impressively managed their returns and beaten S&P BSE 100 return. Among all, only 2 stocks- Reliance Vision Fund and JM Core 11 Fund securing both the position of the top performer as well as the consistent performer. Mirae Asset India Equity Fund, Kotak select Focus Fund, and Reliance vision fund are schemes that had shown consistency in their performance by selecting stocks with strong business models, and providing extensive competitive benefits and good quality management. The analysis is evident that some large-cap stocks had beaten their benchmark while other struggled. So, the best thing for an investor is to get an expert’s advice whose extensive knowledge will definitely help you in choosing the best fund balancing both the risk and reward relationship.